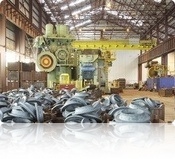 Boltex opened its 205,000-square-foot forging plant on a 16.5-acre site in 1999. The facility includes multiple mechanical press lines, a high production hot parts former, metallurgical testing laboratory, heat-treating, and machining capabilities. In early 2008, a 75,000-square-foot facility was added to house our new 1400 kJ Counter Blow Hammer (140,000 lbs) and our 5,000 Ton Hydraulic press.